My current project schedule is preventing me from building a vacuum form machine or mask for this webinar, but I've really enjoyed attending it. 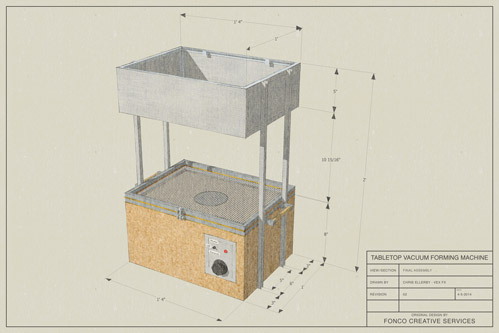 Since I plan on eventually building a desktop vacuum form machine, and really like Fon's design, I decided to make a 3D version in SketchUp so I can have detailed blueprints when my schedule finally allows me some build time. 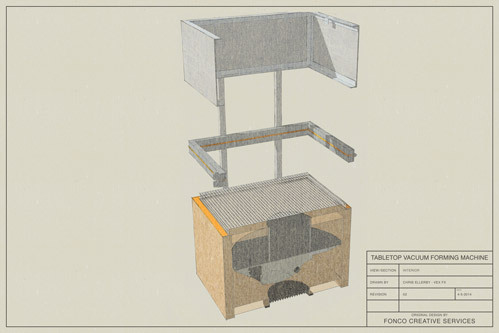 In the spirit of sharing information with the community I'm making these blueprints and the SketchUp model available to the attendees of this webinar with full attribution of the original design to Fonco Creative Services. Please keep in mind that these files are a work in progress and will be updated as I refine the design. Fon: If you have any notes, measurement changes, or design ideas please let me know and I can update the model and blueprints. Tried embedding the 3D model in this post, but it looks like the forum strips out some HTML only after the post is submitted. And it looks like the forum is not setup to allow users to delete their own posts or edit a post after 1 hour. For Vanilla forums both should be configurable in the settings. Thanks for doing this Chris, its awesome. I hurt my knee so I can't really spend a lot of time in the shop, so I've been filling in with pulling a bunch threads from all over. The Proto-form, Volpin's mods, a bunch of the builds from TK560. Also I noticed in the chat some people had bought some pre-drilled sheet metal. The consensus for hole size and placement is 1" (max) spacing and no bigger than 1/16". The handle design has changed to be more like Fon's, rather than using off-the-shelf hardware for the handle. I also updated the top outer (heatsink) box to use 1/2" L channel rather than U channel, and added 1/2" brackets that could be used to bolt on the inner heater box. I also updated the sliced view to depict the frame in a partially raised state, which shows more of the platen. I don't plan on updating the heater box portion of the blueprints until I settle on how I will build mine. I may be creating my own solution with nichrome ribbon wire and ceramic standoffs if I can't find a heater design I would like to cannibalize. I'm also open to suggestions/criticism if anyone feels the dimensions or structure in these blueprints should be modified in any way.